Cambridge University Press, 2008. Scroll down for pdf. 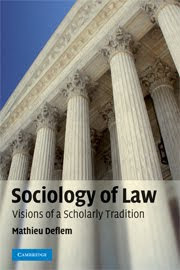 This book presents a scholarly vision of the sociology of law on the basis of a discussion of the specialty's major achievements. Drawing together theoretical and empirical themes, the work reveals the value of the sociological study of law. "This is a formidable work of sociology. Mathieu Deflem spans the spectrum of the sociology of law neither to burry it nor to praise it." —Cary Federman, Contemporary Sociology. "Sociology of Law: Visions of a Scholarly Tradition is another important contribution to the sociology of law, offering an approachable, well-structured introduction to the field for the student, and a scholarly, detailed survey for the specialist." —Matthew Light, Canadian Journal of Sociology. "Deflem’s Sociology of Law presents a discussion – not an exposition – of important theoretical problems and concerns that define the boundaries of this field of specialization. In this effort, Deflem applies his expertise and meticulous research to construct a thorough treatise on the sociology of law." —Dante Gatmaytan-Magno, Law & Politics Book Review. Symposium: Sociology of Law: Visions of a Scholarly Tradition, by Mathieu Deflem. Pro Bono, the newsletter of the SSSP Law & Society Division, 16(1), Spring 2010. Published in 2008, a complete PDF copy of this book is now freely available online. The original print edition can be ordered from Cambridge University Press, online, or via resellers. A limited preview is available via Google Books. See also related writings on law and other books by Mathieu Deflem.